Jillian Strong ’20 didn’t realize her disability had an impact on her learning until after she graduated from college. Hard of hearing since infancy, Strong began to think about how disabilities can affect other students’ academic careers. Now, as a graduate student in the University of Redlands School of Education’s Master of Arts in Higher Education program, she is committed to making students’ higher education experiences more inclusive and accessible for everyone. One way that Strong is already championing students with disabilities is by contributing her unique perspective to discussions in her classes. She often talks about her experiences and encourages her peers to view accessibility in education through a different lens. Recently, Professor Pauline Reynolds updated her syllabi to include a section on disability, thanks to Strong’s input. Outside the classroom, Strong works as a graduate assistant in the Office of Leadership and Higher Education, where she assists School of Education faculty, serves on the orientation committee, and welcomes new students. She recently completed 120 hours of graduate fieldwork in the Academic Success and Disability Services department, where she worked to update the department’s website and improve overall accessibility, while also supporting the Office of Admissions. One of her contributions was suggesting that accessible ramps and building entries be marked on the interactive campus map and taking pictures of those locations so they could be added. Strong’s passions for student affairs and accessibility don’t go unnoticed. 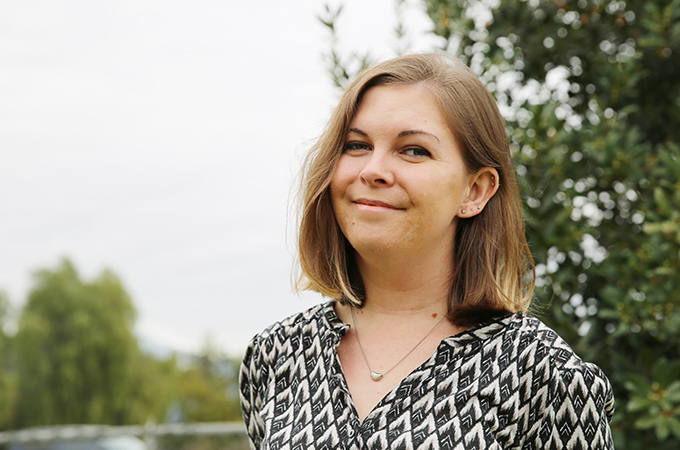 In November 2018, the National Association of Student Personnel Administrators (NASPA) awarded her the Sharyn Salvin Miller Graduate Scholarship, allowing her to attend the organization’s western regional conference in Sacramento, California. In March, Strong will attend the organization’s national conference and serve as a small group facilitator at the NASPA National Undergraduate Pre-Institute. The conference challenges student affairs professionals to think differently about serving changing student populations. Upon graduation, Strong hopes to work in a college disability services department. “I want to remind people that education isn’t straight-forward and students don’t all learn the same way,” she says.